See Also: The Eritrean Youth Must Save Eritrea. 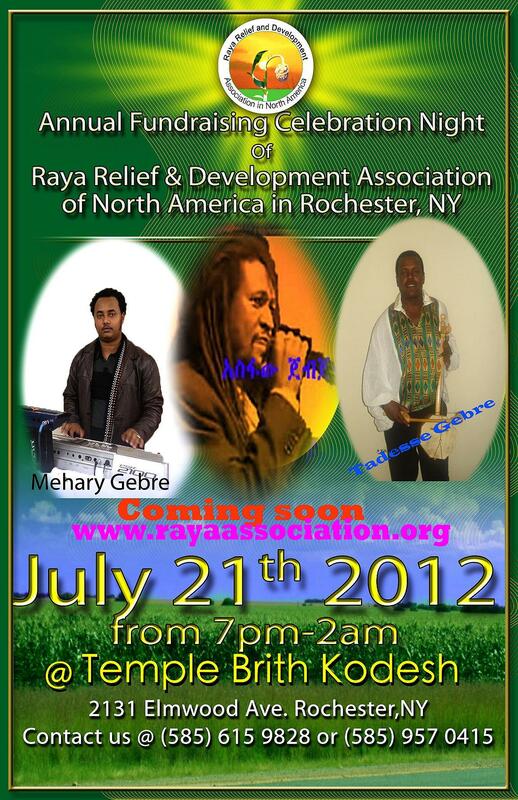 Successful Fundraising Event in Addis by Queen Sheba Alumni Association!! The Queen Sheba Alumni International (QSSA-I) Association has raised over 40 million birr in donation and pledges on the first leg of fund raising event in Addis Ababa! 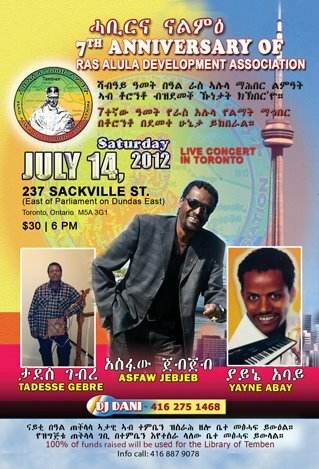 The money was raised from friends and supporters of the Alumni and according to the organizers there will be another fund raising event in Adwa this coming week end. The money raised will be used to build new library and structures in Adwa city! 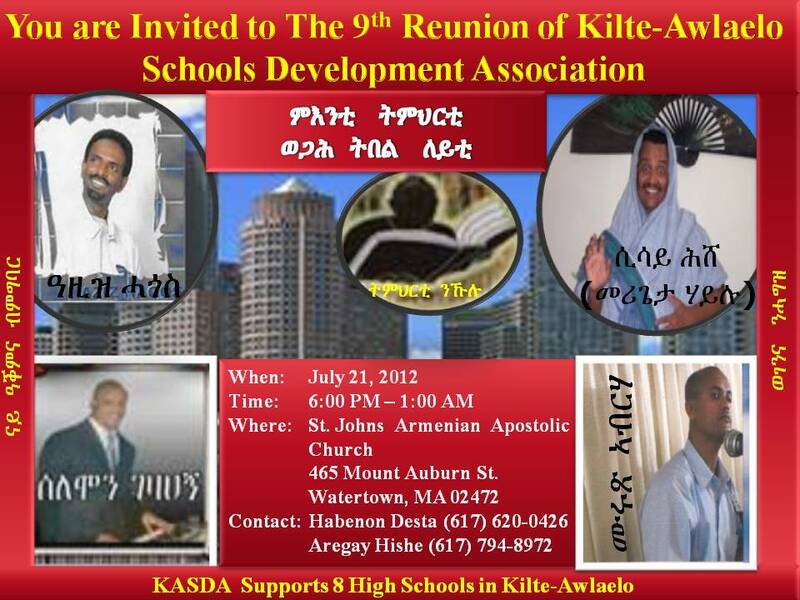 The association was established to help the schools of Queen Sheba in Adwa and surroundings and is holding its third annual event in Ethiopia this year. �ሁሉንም ነገር ሽብርተኛነት? ወይስ ሁሉንም ነገር በሽብርተኝነት? Ayte Gebremichael Gidey, Abreha we-Atsbeha�s community administration chairman, was welcomed by higher government officials of Tigray regional state and Mekelle University�s administration on June 27, 2012 at the office of the president of the regional government upon his arrival from Rio de Janiero, Brazil, where he has received $20,000 and a recognition. Addis Ababa, June 27 (WIC) � The Federal High Court on Wednesday found Andualem Arage and others, charged with crimes of terrorism, high treason and espionage, guilty as charged. The current anti-terrorism law that was enacted a year or so ago stipulates that the government will confiscate properties of anyone convicted with such offense! Now that most of the 24 people charged are found guilty by the court the question is how will the government enforce the law or will it look the other way? According to our sources in Addis the government is likely to follow the law to the fullest but stay tuned!.... See Also: CPJ's expected response to the ruling! Addis Ababa June 26 (WIC) - Ethiopian Sugar Corporation said the allegation made by Human Rights Watch (HRW) in connection with displacement of people due to sugar development projects is an overstated and a groundless fabrication. said. ሃይማኖት ውስጥ በመወሸቅ የከሰረ ፖለቲካን ማስታመም ይቻላልን? Queen Sheba Schools Alumni Association shipped over 50,000 new books to Adwa Schools! Ethiopia Praised For Its Effort to Reduce Child Mortality at a Global Health Forum in Washington D.C. The lovely Eden Latest, simply wonderful song, well produced and recorded!